This sofa table is made of California black walnut with a center strip of pecan. The long legs bring the top to 32 inches, the same height as our living room sofa. We needed our top to be 10 inches wide, but only had 6 inch boards. The solution was to get two clean edges on our boards using the table saw and jointer. 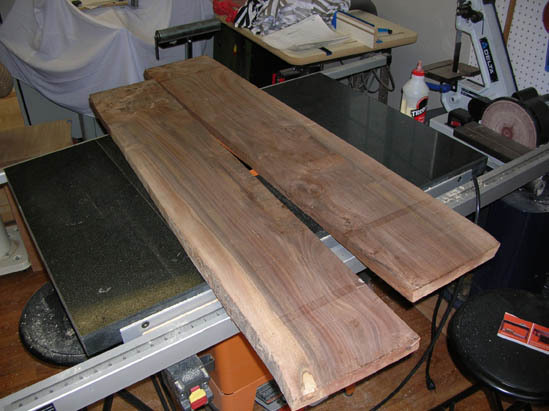 To add a bit of color, we cut a 5/8-inch strip of pecan to run the length of the table and glued it between the two walnut boards. 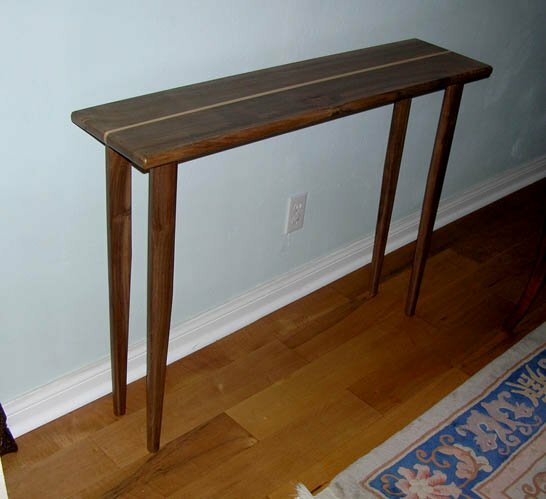 We wanted our sofa table to be 40 inches long, but came up two inches short due to our available pieces. It's all good, we made it work. 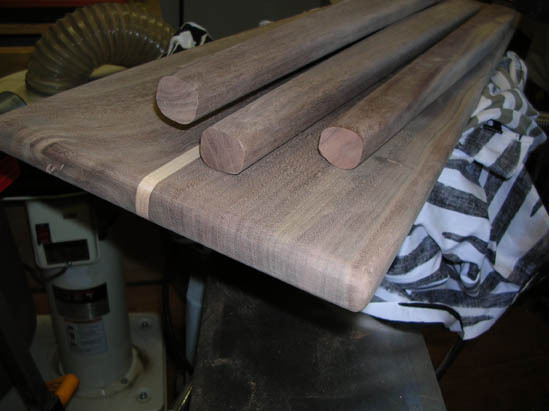 To taper the legs, we measured down 12 inches on the 2-inch wide legs and drew a line to 1.25 on the bottom. We cut the line with our band saw then routed all edges round. 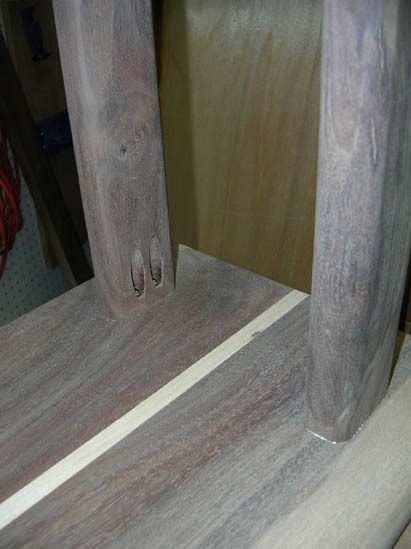 We also routed around the top edge. 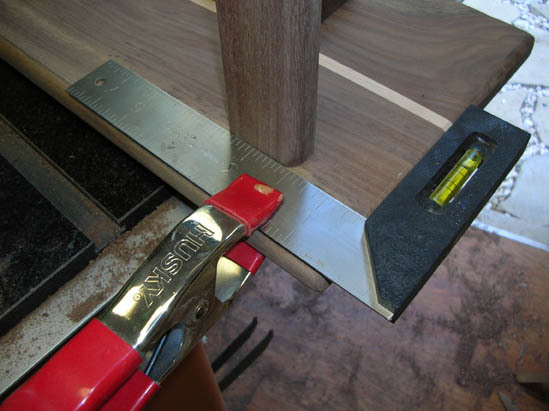 The tricky part of getting this sofa table together is attaching the legs. We like pocket hole screws and glue. Here's our Kreg jig setup. 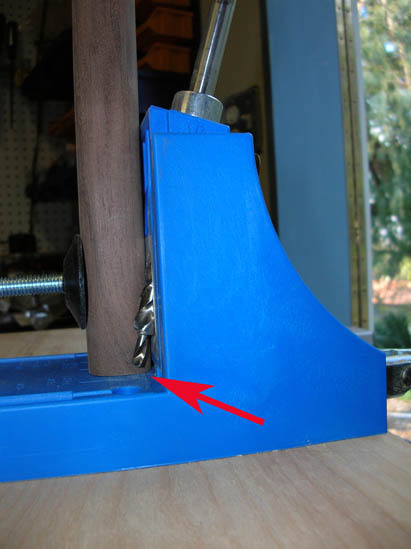 The arrow shows where the bit comes through the jig. When drilling these holes, be sure to check the finish drill height and remember to use the proper length screw for the thickness of your material. If you're not sure about the screw poking through, drill and attach a test piece first. We could have measured the board, made some marks, and been uber-precise about locating the legs. Instead, we used our square and set each leg individually. 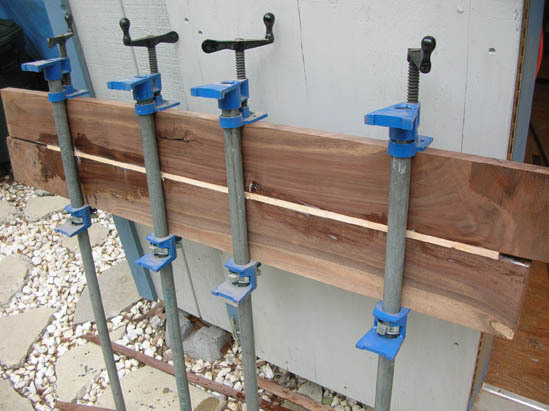 If we had a bunch of these to make, it wouldn't have been too hard to make a small positioning jig. Two screws and some glue for each leg. No need to clamp when driving the screws. In anticipation of rough use, the table is finished with several coats of polyurethane. Sanding between coats help bring the walnut grain out. Tapering the legs make this look taller than it actually is. We took a long time thinking about this project before getting to the shop. It turned out to be a lot simpler and more interesting than we envisioned. So, yeah, we over-thought this one. It's a great project that requires only a few tools.